Tim Zajac, a 2006 baritone player with Glassmen, sent this picture. I am a theatre student at Illinois State University, where I am a member of the Big Red Marching Machine, our school's marching band. I am fortunate enough to march with many drum corps veterans, and in my baritone section alone, we have members of the Glassmen, Madison Scouts, Bluecoats, Santa Clara Vanguard and Pioneer! Recently we toured the Chicago suburbs, and many of us brought our corps jackets along. 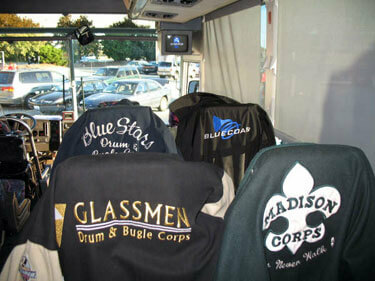 In this picture we put our jackets on the backs of our seats in true drum corps tour fashion! Here we have the jackets of Melissa Castor (Blue Stars), Matt Becker (Bluecoats), John Damore (Madison Scouts), and my own corps jacket from the Glassmen!